Summary: A sparkling talent makes her fiction debut with this infectious novel that combines the charming pluck of Eloise, the poignant psychological quirks of The Curious Incident of the Dog in the Night-Time and the page-turning spirit of Where’d You Go, Bernadette. My book club is part of the Book Club Girls Book Club which means that we not only get books for our group for an entire year, but we also occasionally get surprises! One of those surprise treats was the novel BE FRANK WITH ME by Julia Claiborne Johnson. I thought BE FRANK WITH ME was a unique story that I found very entertaining. I would probably say the best word to sum up BE FRANK WITH ME is "quirky." BE FRANK WITH ME centers around Mimi Banning, a reclusive author (and former Pulitzer prize winner) who must write a new novel (her first in decades) because she desperately needs the money. Her New York publisher decides to send a young assistant, Alice Whitley, to her Los Angeles home to keep an eye on her... and her seven year old son Frank. Alice isn't quite sure what to expect when she meets this famous author, and it's safe to say that everything is a bit of a surprise. Mimi is a piece of work. She's difficult and not exactly easy to get close to... and that's probably an understatement. Her son Frank, on the other hand, is a bit of an odd duck. He's rather eccentric, dressing like a movie star from the golden era; and he seems to have some issues with relating to other children. And he also doesn't want his things or even his own self to be touched! I thought BE FRANK WITH ME was absolutely charming. When I started reading this book, I was immediately hit with just how different this book was. I loved the author's writing style, and the characters, especially Frank, were fantastic! That I was smiling and even laughing out loud as I read the book added to my enjoyment. In fact, I couldn't wait to get back to the story ever time I had to put it down. I also really enjoyed that the story was told through the eyes of Alice. Alice was a fairly young woman from Nebraska who had moved to New York and was scooped up by a publishing executive to work as his assistant. I thought Alice was a great character, and she was the perfect person to "take care" of Mimi and Frank. I loved her relationship with Frank and how she eventually gained his trust. It was a special bond and quite touching! In addition, I enjoyed that this book was also about Alice and her feelings while living with Mimi and Frank. I don't think I'm giving too much away to say that Alice finds that she is attracted to Xander, and there's a bit of a romance along the way. Alice had absolutely no idea what she was getting herself into when she arrived in Los Angeles, and I thought her frustrations and doubts were interesting to say the least. It's not secret to the reader that something big is brewing in Alice's story -- there are more than a few hints along the way. The story does get rather unbelievable, albeit still entertaining if you choose to suspend reality; however, I will admit that I enjoyed the first half of this novel more than the second. I loved the parts of the story that focused on Alice and Frank's relationship, so when things started branching out and getting a little crazy, the book lost a little of its novelty to me. That being said, I really did like this book. 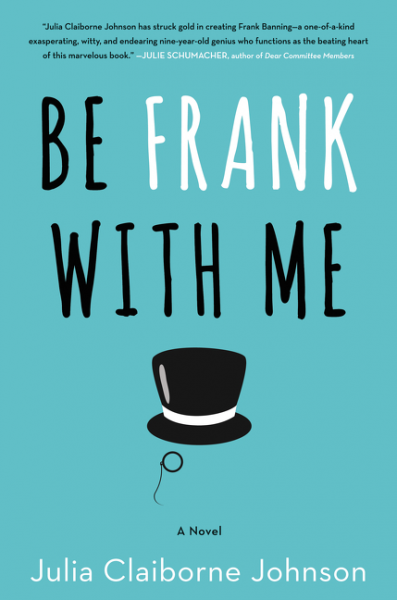 BE FRANK WITH ME would make for an interesting book club selection. There is a reading guide with twelve questions that should help stimulate discussion. Some of the themes you might want to explore include privacy, fame, second chances, autism, labels, curiosity, parent/child relationships, coping mechanisms, and more. I still find it hard to believe that BE FRANK WITH ME is Ms. Johnson's debut novel -- it's such a different story. The characters were quirky and the story was entertaining. Highly recommended! I don't think I enjoyed this one quite as much as everyone else and I'm not really sure why. I think some of the relationships felt off to me.